Ending any Sri Lankan trip (as we did - read about the rest of the trip here) with a day or so discovering the tiny 17th century town of Galle Fort on the southwest coast of the country is a must. The UNESCO World Heritage Site, and the best preserved colonial sea fortress in Asia, has had a bit of a renaissance over the last few years with lots of investment (mainly by expats and Sri Lankan elite), turning it into a cosmopolitan little enclave. The once run down colonial buildings that line the maze of narrow atmospheric streets within the fortified walls have been spruced up and now house boutique hotels, cute cafés, stylish shops and the whole place has a rather buzzy vibe. Strolling the elevated coral and limestone ramparts of the Fort in the company of a local is an interesting lesson in Portuguese (who first constructed it), Dutch (who fortified it), British (who were the last colonisers) and Sri Lankan history. You’ll get to understand how Galla (as it’s called in Sinhalese) got its name, and will discover that the inhabitants (around 500 families) are primarily Muslim, which is why minarets sit side by side with church bells and spires. Your tour will finish at the iconic lighthouse in time for a (hopefully) beautiful sunset and maybe a local cricket match. After a few weeks living on Sri Lankan food you’ll be hooked and will definitely want to give it a go when you get back home, but the right spices are a must. Head out from the comforting arms of the fortified walls to Galle new town where life all becomes a bit more chaotic - the streets are snarled with traffic and it feels like the volume has been turned up a few notches as tuk-tuks toot incessantly and stall traders holler for business. But here in the mayhem you’ll find the unassuming Spice Shack and a friendly local guy who will talk you through recipes and tips. Unfortunately you just can’t so no to his charm and we ended up coming home with a kilo of the finest Sri Lanka sweet cinnamon, the perfect dahl and garam masala mixes and freshest turmeric, but all at a fraction of what Sharwoods charge! The stunning countryside on the outskirts of Galle is a great place to experience authentic rural life. First sail serenely down the river passing water monitors and pretty as a picture water lilies. Sitting in a beautifully restored heritage building with arches and long verandas, from the outside the Fort Bazaar looks like many of the other properties in the old Fort, but that’s where the resemblance ends. 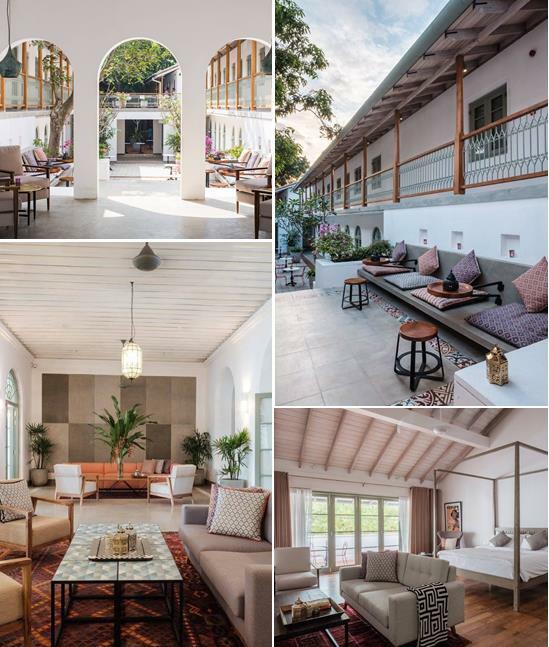 Everyone is welcomed with warm smiles as they cross the threshold, whilst inside it's all fresh and contemporary (think Farrow and Ball colours), accented with eye-catching floor tiles and ethnic cushions drawing from the Fort’s Moorish heritage. The rooms are set around a central courtyard that comes into its own at night when lit with a myriad of twinkling candles. I loved the Upper Suites on the third floor with their private terrace and views across the Fort’s red tiled rooftops. The swimming pool is secreted away and there is also a spa and cinema room. Boasting an exceptional line-up of up and coming and prize winning Asian and international authors, the festival has become one of South Asia’s major cultural draws. It’s held in January and, along with literary discussion and debates, the popular festival also incorporates Fort walks, poetry readings, wine tastings, cookery classes, gourmet dinners, concerts and late-night jazz performances. If you’d like some more information on visiting Galle or would like me to put together a totally bespoke Sri Lankan itinerary for you, then please do get in touch.